Supplier members of the Florida Apartment Association learned how to improve sales, from gathering prospects to closing the deal, at two educational seminars presented by the FAA Product/Service Council in conjunction with FAA’s governance meetings in May at the Hard Rock Hotel Daytona Beach. B: Build familiarity. Be visible at many different events. When you are at an event, be completely present, not distracted by your cellphone. R: Be a resource. Stay current with what’s going on in the multifamily industry, not just your own product or service. A: Position yourself as an authority. One way to do this is to write a blog: Make a list of five of your clients’ biggest challenges, and write a blog post addressing each challenge. N: Nurture relationships. While only 1 to 3 percent of people are in the market to buy your product or service immediately, some of the other 97 to 99 percent may be in the market later. Nurture your relationship with them now for possible payout later. D: Be different. Don’t just send the usual sales and marketing emails, for example; think about information your prospects might be able to use, such as the best lunch venue in a new city. Darling also emphasized the importance of follow-up: "Ninety-five percent of sales are lost because of a lack of follow-up. It takes seven to nine touch-points to get an appointment." Tell your prospect how you’ll follow up and when, and then do it. Following a brief PSC meeting, business communication expert Jess Todtfeld took a show-and-tell approach to "Speak to Close: Where Sales Techniques Meet Presentation Skills." Todtfeld started off with some "don’ts." He used an example from the iconic Wizard of Oz and read a snippet of the "Oz" script, then converted that script to bullet points, before ultimately demonstrating how "showing" can be more effective than "telling." Move your head: Make eye contact. Use your hands: Be real and authentic. Play with your voice: Change your pitch. Pause. Play with volume. At the same time, Todtfeld noted, be sure your message includes substance and is not just style. Have a point, and be memorable. At the conclusion of the education sessions, suppliers then joined FAA leaders from the management side of the multifamily industry for a networking reception, where they were able to test out some of the ideas they had learned. 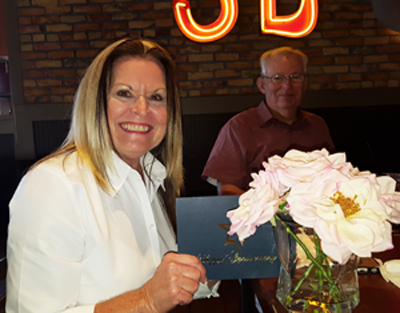 Jackie Collins, former Space Coast Apartment Association board member and sponsorship chair, recently celebrated 31 years with JMG Realty. She has been a member of SCAA for more than 20 years. She has been at Woodlake Village in Palm Bay for 20-plus years, and she and her team have managed the community to a 100 percent occupancy rate for 26 out of the last 27 months. Are you or someone in your multifamily management company celebrating a promotion or significant job change? Share your news with your peers in the industry. Send a brief write-up and a photograph to laureen@faahq.org. Be sure to include your contact information in case there are questions. If you are submitting on behalf of someone else, be sure to include that person's contact information for verification and permission to publish. Celebrate and support APAC while enjoying a private VIP cruise on the Intracoastal Waterway at Boca Raton. More than half of the available tickets have already sold and only 150 remain.